This judgment confirms that as Western Sahara is legally defined as a non self-governing territory by the United Nations that any trade agreements between Morocco and the European Union cannot apply to any items that originate in the Western Sahara. This merely confirms the clear position that under international law that the occupation of Western Sahara by Morocco is illegal. We await the opinion of the full European Court and to hear what steps they will take to enforce international law by ceasing all trade with Morocco until a free and fair referendum of self-determination is held under UN supervision that determines the legal status of the Western Sahara. For over 40 years long the international community has stood by and allowed the Moroccan authorities to profit from an illegal and brutal occupation of Western Sahara. 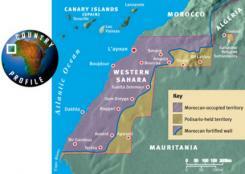 They have plundered the fish and phosphates for huge profits whilst over 150000 Saharawi live in refugee camps. It is time for the international community to enforce international law and allow the Saharawi, the indigenous people of Western Sahara, to decide for themselves who profits from the natural resources of their territory. You can read the ECJ's Press Release here.